Everything you need to create projects, invite others and stay updated with activities, tasks and events. ConnectElements.com is brought to you by Concursive Corporation. 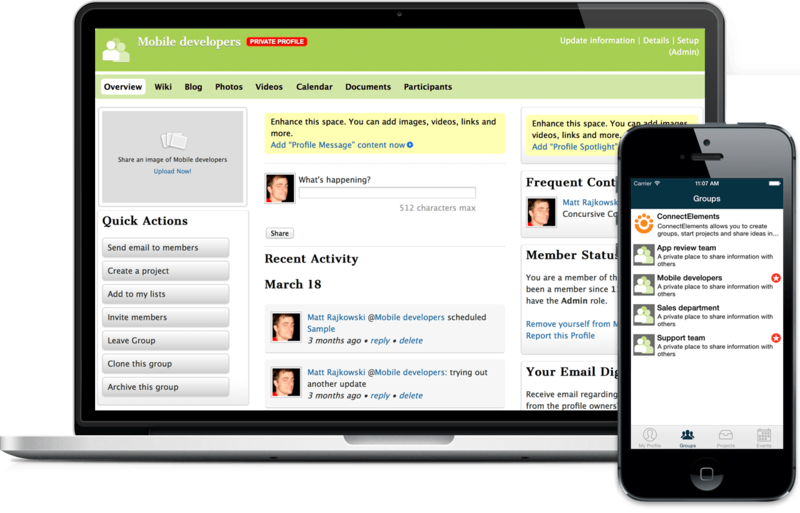 We specialize in social business software which helps you build communities that matter. Read the ConnectElements.com blog for the latest news. From companies, to departments, to small teams... create groups to stay informed. Create private projects and invite those which you want to collaborate with. Post updates, write blogs, write in a wiki, share documents, and much more. Get notifications, post activity updates and photos, and check your events. ConnectElements.com is for creating groups and projects in a flash!